Double vision is possibly my biggest hidden disability. In April 2015 it reached a critical point. My optician could no longer correct the problem using prisms in my glasses. I recently discovered the FCAROLYN Eye Patch . I think the FCAROLYN silk eye patch is such a good solution for double vision. This patch slips easily over either lens of my glasses via the arm. The silk eye patch can be used on any type of glasses. It completely eliminates double vision and I am not aware of my eyelashes rubbing against the patch. Both my eyes are open but I’m only able to see through one lens of my glasses. Subconsciously I close an eye, usually my left one especially when using a computer. I don’t even know I’m doing it. With an FCAROLYN silk eye patch my double vision is completely eliminated. 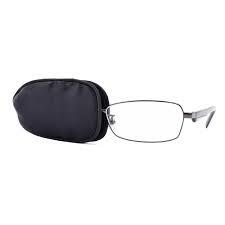 Equally important the patch does not need a specific glasses frame. In a matter of seconds I can move the patch from one lens to the other. It is made of silk so there is no scratching to a lens of the glasses. I cannot see what there is not to like of the FCAROLYN silk eye patch solution to double vision. Seeing two of everything is incredibly tiring and has all sorts of unexpected problems. One big problem is that I am unable to see anything in fine detail. When it comes to reading I see two pages of words. Originally I thought the problem was with the prescription of my glasses. I soon discovered looking with a squint. So I looked through one eye and suddenly everything was crystal clear. Invariably I get a headache as well as eye ache. When I get eye ache I rub my eyes and this only makes the problem worse. Shopping in a supermarket is fraught with problems. Dodging around people when riding on my mobility scooter; I certainly don’t want to drive into people. Reading the shopping list and worst of all entering my pin number when I pay with my credit card unless I can use contactless. I still use glasses with the magnetic clip-on frame. The FCAROLYN Silk Eye Patch for Glasses can be used on any glasses, this is a very big plus point. I had forgotten you had double vision. I have to admit that I hate wearing a patch or eye cover outside the house, there is an element of vanity. The problem only really troubles me when using the computer or reading. 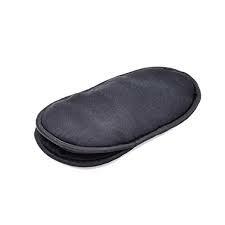 This patch can easily be slipped on to the glasses and used to cover up either lens. I really do find very useful.